If my blog isn't updated that much in February, it is because it is a hard month for me. In ten days, I reach my two years of being sick. I am not sure how to feel about this, because it was completely unexpected. I went to bed and couldn't get up the next. My doctors at that point though it was something simple, but it turned out to be complex. So complex that I don't really understand it yet. I only know that it is forever something that I will have to deal with. My family, friends, and books are what has made it bearable and I am thankful for all those things. Lately, it has also been harder, because in November my doctors found that my first infection is still there. Meaning that I will be on antibiotics for at least six months and they might have to do surgery in order to see what is wrong with the muscle and joint in my hip area, and why it hasn't healed yet. Honestly, dealing with this... it is like a part of myself has died. The child-like shy girl of ages ago. So here is some random stuff. Photo to the Right: taken March of 2007, right after I got my drain off. I couldn't shower for 15 days. I learned to love Baby wipes in that time. My hair is also really thin, compared to my normal hair. Last book read before Sick: Lets Get Lost by Sarra Manning, I try to read it every year though it hurts in a way. I think that is enough of memory lane for me, before I cry too much. This will also be an explanation of bitchiness, sadness, and other emotions in coming weeks. Meg has always wanted to get away. To push the limits and just lives When she is dared to go on a railroad bridge, that supposedly a couple died on year away. She thinks nothing of it. When the police come, Meg and her friend are arrested and saved by a matter of minutes. As punishment, they aren't allowed to go to Miami Beach for spring break. Instead, they must work with the Police Force, Firefighters, and Paramedics. When she is matched with Office John After, she isn't happy. He was the officer that brought her in. He is also only a couple years older and she was in Spanish with him. Soon, she finds her self falling for him. When secrets and misunderstanding come along, will she be able to handle it. I loved this book. It was so amazing. All the characters seemed so real and I also really liked Meg. She was very awesome. John was also very amazing and easy to fall for. This book also had an amazing plot and lots of twist and turns. I will definitely have to check out some more books by Jennifer Echols, since this was my first. It comes out March 17th. I hope you buy it and enjoy this amazing read. Terra Rose Cooper is tall, fit, and blonde. On the left side of her face, she has a port wine stain. The birthmark is about the size of a palm. It is not some blemish that you can easily cover. People have stopped and stared, creating a ruckus in her life. This is one feature that Terra would love to be without and she hides it under layers of make up. Another flaw in her other wise perfect life, is her controlling father. He is cruel to his mother and belittles each flaw. Terra just wants to escape and she can not wait to escape to a college on the east coast. The problem is that her father will not pay. In a crash of fate, Terra meets Jacob, a goth Chinese boy that she can't seem to get out of her mind. The only problem is that Terra has a boyfriend, that she can't really connect with. With the help of Jacob, her mother, and a little orphan, Terra discovers what True Beauty is and what it means to her. Check out, Justina's Blog and Justina Chen Headley's Find Beauty Challenge. Asha is the second daughter in a very traditional in a Bengali family in the 1970's. There are riot and jobs are hard to find. Asha's father is forced to go to America in order to find a job. Her sister Reet, her mother, and herself are going to Calcutta; They are going to live with her father's family. In Calcutta, Asia is trapped in her Grandmother's house. She is unable to go to school, because of lack of money. Her mother finds it disrespectful for her to go outside of the house, on her own. So her freedom is limited. 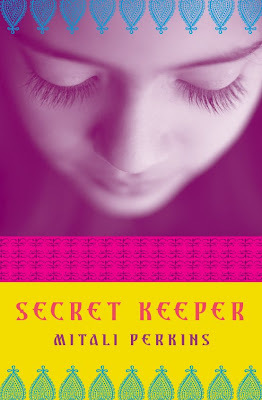 Asha finds relief in writing in her diary or as she calls it, her Secret Keeper. She tends to write on the roof, until she find out that her neighbor, Jay has been spying on her. He wants to paint her. Asha's sister, Reet has caught the attention of the young men in town. Many are their cousin's Raj's friends. Asha and her family are left with difficult decisions that would alter their life's. I found this book to be well descriptive. The characters drew a hole in my heart from how life like they were and how the ending wasn't exactly what I wants. It was still amazing. If you want to discover a book, that will pull your heart strings and makes you wonder... How much would you sacrifice to save someone that you loved? It also was great at making Asha and It seem like real sisters. I really hope that you check this book out. Also check out, Mitali's Blog. I am really busy this week, so I stopped the contest at 11:300 instead of midnight. I doubt anyone else is going to enter. Anyways, there were 48 entries, with 71 extra entries. Paradox. Paradox has passed. So, it goes to Katie of KD's Library. So, Thanks for participating and making my first contest very amazing. I am going to e-mail the winners, now. Hope everyone has an amazing week. Also, Happy Reading. 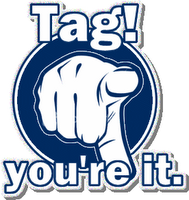 Link to the person who has tagged you. Write down six things that make you happy. Post the rules, tag six others and let them know you did it. Then tell the person when your entry is complete. 2. Devyn, you can do it on any of your blogs. This probably one of the sequels(That is saying a lot with all the sequels that are coming out.) that I am looking forward to the most. The cover is amazing. The main character looks like Chloe and almost like her necklace, except it has a heavy chain. I have read the sample chapters and now I really just want to read the book. If you have read The Summoning, then you know how the plot was left at and if you haven't... I highly recommend it. I got it finally. Megan convince me to get it. Anyways... I need your user names if you want to talk. So just Add me and we can talk about Books, Movies, Music, and anything else. My user name is Sarahbear9789. So, YAY for AIM and now I am going back to reading. Alice lost her mother to cancer, years ago. The pain is still present to this day. She covers her sadness in music, lyrics writing, her best friend Claire, and her boyfriend, Blaze. Her father is remarried and the baby is coming soon. When Ivy does arrive, Alice doesn't want to see or Victoria. When she learns that she has to go to Victoria's parents for Thanksgiving. She is not happy. Thanksgiving doesn't go that well and to top it off, her father has to leave for buisness. Victoria decides to leave early, inorder to miss a winter storm. Alice wakes up and there is snow everywhere. She realizes that she will have to work with Victoria inorder to live. I liked this book. It made me think, about what I would do. About love and lost. Also, myself. Schroeder is a master of verse. Each word has an impact to the story. If you liked her debut novel I Heart You, You Haunt Me, you will love this. I highly reccomend this and hope you like it. Lisa is a member of Author2Author. The other members, Kate, Kristina, Deena, and Emily all are interesting and create great blogs. Check it out. Molly's mom has remarried and she is getting dragged on her mom's honeymoon. That is to do a house swap in Boulder, Colorado. Charlie Richard learns that his moms plan to take him and his sisters to Hollywood. Molly's doesn't feel that she'll get the inspiration to make her designs. Charlie feels lost on the streets of Hollywood and just wants to be on the trails. Both are sure that they will have a boring summer. Until they learn about each other, in their rooms. I found this book to be very cute. It was also a quick read, and very face paced, while still giving the whole story. Both Molly and Charlie are interesting characters, that you will want to be friends with. The plot also was not predictable. So, it you are looking for a very cute and quick read, I recommend In Your Room. I have read The Elite and In Too Deep (reviews for both soon). I liked the covers, of both book in the series and this one is no different. I like the fact that green is the main color in this one. Also the fact that the models hair makes her seem lost or confused. After how In Too Deep ended, I can not wait to read this book. I hope that you check out this series out and Simply Irresistible in July. It was very fantastic and just an incredible book. It is about a boy that loses his family and everything by a giant wave. A English girl lands on the island and they have to work through language and cultural difference to build a Nation. Princess Aurelia is the next in the line for the throne, and her life is in danger. When her school friend, Robert returns. She is excited. Robert has returned in order to figure out, who is trying to kill Aurelia. Soon, she finds out that she is in danger and helps to find who is trying to kill her. I loved this book. After, having a hard time fitting in New York. Rico decides to move to Wisconsin, to cut loose from his old life. Soon he finds that their are somethings, you can't runaway from. It was a fairly good book, but hard to get into. Leave a comment or E-mail me at Sarahbear119 (at) hotmail.com with the subject "Contest" I am sorry that I will not be able to ship internationally... I am just a broke teenager. 4. If you were referred by someone. I'll give each of you an extra entry and if I referred you, just say so. So, Best of luck and the Contest ends on January 25th at Midnight(PST). These books, I got from Amazon from family members that just give me a gift card, because they have no clue what to get me. I had already read Story of a Girl and Life as We Knew it. I just read Far From You and Unraveling, both were amazing books. The rest are books that I heard were good and wanted to read them. I also got the movies, Atonement and Juno. I was sent Going too Far for review. So, this doesn't count the 10+ library books, I checked out. I rarely get books in the mail,so it is kind of overwhelming in I-Have-No-Clue-What-To-Read-Next feeling. So What did you guys get in your mailbox or buy this week? All Meg has ever wanted is to get away. Away from high school. Away from her backwater town. Away from her parents who seem determined to keep her imprisoned in their dead-end lives. But one crazy evening involving a dare and forbidden railroad tracks, she goes way too far...and almost doesn’t make it back. It sounds amazing. It comes out March 17th. Also, check out Jennifer's blog. 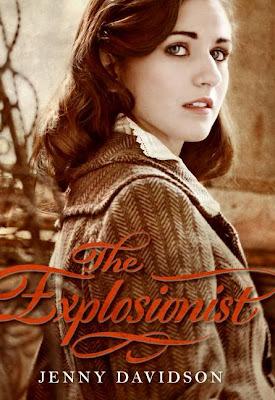 The Explosionist is set in a parallel world. Napoleon defeated Wellington at the Battle of Waterloo in 1815. This caused many other event to conspire and create a very interesting world that you want to learn about. Sophie Hunter lives in Edinburgh, Scotland in 1938. She goes to an all-girls school and hopes to be a scientist. Currently, bombs are going off all around the city and all young women might be forced to be drafted in to some sort of public service. Will this stop her dreams? After receiving a message from a medium, and soon after the mediums murder, Sophie finds that she might be in more danger. With the help of her friend Mikael, she uncovers the truth and it effects not only her, but all of Europe. This book was amazingly well written and very interesting. The characters are amazingly real and loving. Once you start this book, you will be glued to the story. The story starts off slowly, but then you are put into this pit of amazing mystery and intrigue. There are some complicated plot twist, but it keeps you mind full of thoughts. This dystopia of a parallel world will keep you until the last word and then it will stay you for long after. The ending will make you want more, because it is such a wonderful book. Operation Teen Book Drop was started last year by Readergirlz and YALSA. It was a huge success. 10,000 YA books were given to top pediatric hospitals and encouraged others to donate. Last year, I was interview about this subject, because of my love of books, my past extended hospital stays, and my involvement in Readergirlz. Also, check out Little Willow's post on it. I joined this yesterday and I am excited. I have only read the 1-3 of the Dollaganger Series. So, I am going to read that whole series. I also think I am going to read the Casteel Series and My Sweet Audrina. 1. Tag 3-5 people, so the fun keeps going!2. Leave a comment at the original Post at A Striped Armchair, so that Eva can collect everyone’s answers. Charlotte's Web or Bride to Terabithia. I don't really have any picture books on my shelf, because those have given away. I love those two books. My bible, I got it when I turned 10 and I was so happy to get it. Looking for Alaska, it was one of the books that got me back in to reading when I was really sick. The 1st time, it took me three days, but I was on codeine and I sleep a lot on that medicine. Every time, I have surgery. My mom give me a book or two. I got City of Ashes, Thriteen Reason Why, Let's get Lost, The Host, Bloom, Revelations, and a few other books. I also found a copy of Octavian The Nothing Vol. II in like May of the last year. I still have yet to read it. I just bought The Elite on firday, because I got In Too Deep in the mail. They are on my to read next list. Harry Potter, I have read these books so many times. I can't explain how amazing they are. Just read them and trust me. Twilight, does anyone else love yet hate this book? Discuss in the comments. I love Melina Marchetta's books and one thing that they always have are really pretty covers that make me want to stare at them for ages. Finnikin of the Rock is no different. I want to read this book so badly. 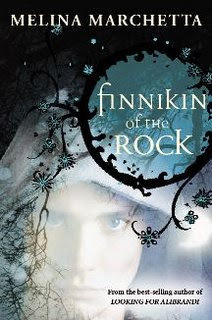 "At the age of nine, Finnikin is warned by the gods that he must sacrifice a pound of flesh in order to save the royal house of his homeland, Lumatere. And a curse is put on Lumatere, which traps those caught inside and forces thousands of others to roam the land as exiles, dying of fever and persecution in foreign camps.But ten years later Finnikin is led to another rock to meet the young novice, Evanjalin. 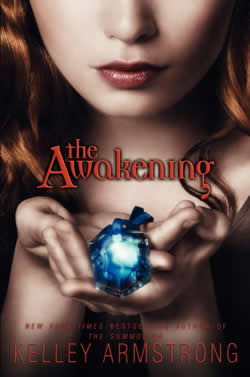 A girl plagued by dark dreams, who holds the key to their return to the Land of light... "
The plot sounds fantastic. It is already out in Austrailia, but will not be out for the US till Spring 2010. I need to make some friends with Austrailians, so that we can trade books. Seriously. I guess I'll just re-read her other books till then. This is my review of Cracked Up To Be, I did write about the cover a few weeks ago. So check that out also. Summary: At one point, Parker Fadley was a straight A Student, a Cheerleader, had a great boyfriend, and overall just a nice girl. Suddenly something had one night at a party. Parker is now failing every class and in jeopardy of not graduating. She dumped her boyfriend, Chris. She had been caught drinking in class. What is the secret that Parker holds? My Review: The character are amazing. I could picture Parker, Jake, Chris, and Becky, so well. I loved Parker's Spunky, Witty, and an amazing narrator for the story. I don't want to dig in to the plot that deep, because it is a very strong book that you just have to read. The plot was amazing and had me reading on Christmas Eve till I finished it at about 4 AM. Cracked Up To Be is a real page turner. I loved the fact that as you read you got flashbacks into the past and that they were done so well. This is easily in my favorite books ever and definitely of 2008. I highly suggest going to your nearest bookstore and pick up this book that is too amazing for words. 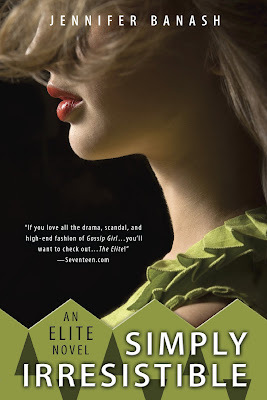 This is Courtney Summer's debut novel, and I can't wait to read the next one.